Alyssa Graves delivers a pitch during a game this season. Graves and the Butler softball team begin the week with a April 11 matchup against Purdue Fort Wayne. Jimmy Lafakis/Collegian file photo. The Butler women’s golf team began play at the Indiana State Invitational in Terre Haute on Sunday, and will continue play into Monday. Heading into the competition, the Bulldogs were coming off a 10th place finish out of 12 teams at the Bobby Nichols Invitational in mid-March. Previously, they finished first out of five teams at the Savannah State Spring Fling. Play gets underway on Sunday and lasts through Monday. The men’s and women’s golf teams will have just a short trip north when they travel to Carmel, Indiana, to compete in the Big Four Classic on April 9. The men last competed in the Butler Spring Invitational on April 1 and 2, finishing tied for third at the Bulldogs’ home course at Highland Golf Club. For the women, the event will be a quick turnaround from competing at the Indiana State Invitational on Monday. Both teams will have just one more competition after the Big Four Classic before the Big East Championships. The Butler baseball team began Big East play this past weekend with a 1-2 home series against St. John’s. Before resuming conference action this upcoming weekend, the Bulldogs will travel up to Muncie, Indiana, for a mid-week matchup against Ball State. The Cardinals are coming off a 1-2 series against Central Michigan and are 20-11 on the season, including a 5-2 mark in MAC conference play. Last season, the Bulldogs defeated Ball State 6-2 at Bulldog Park behind six innings of two-run ball from now-senior Sam Hubbe. First pitch from First Merchants Ballpark Complex is slated for 3 p.m.
After a 16-3 loss at Marquette over this past weekend, the Butler lacrosse team will look to get back in the win column when it travels to South Bend, Indiana, to take on Notre Dame on Wednesday night. This will be the first ever meeting between these two teams. The Fighting Irish are 11-2 on the season, and coming off a 15-13 win over Virginia Tech this past Sunday. Action from Arlotta Stadium is scheduled to begin at 7 p.m. 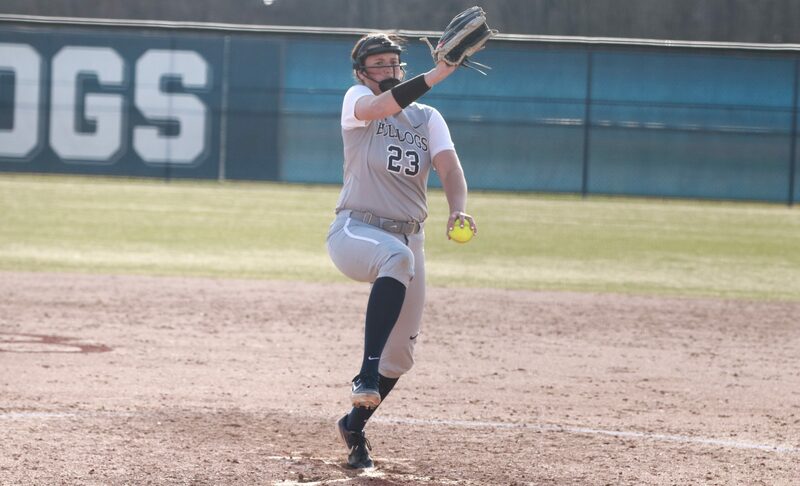 The Butler softball team will take a brief break from conference action when it hosts the Mastodons of Purdue Fort Wayne on Thursday. The Bulldogs are coming off a 1-2 series against Seton Hall over this past weekend. They are now 13-22 on the season, including 2-4 in Big East play. The Mastodons enter the week with a 6-27 record, including a 1-8 mark in Summit League play. Purdue Fort Wayne is coming off a 1-2 series against North Dakota over this past weekend. First pitch from the Butler Softball Field is slated for 4 p.m., and the game will be broadcast on the Butler Athletics Facebook page. The Butler women’s tennis team will play in its first match in nearly two weeks, and final match before the Big East Tournament, on Friday when it hosts Xavier. The Bulldogs have lost four of their last five matches, and are currently 1-5 in Big East play this season. The Musketeers, meanwhile, are a perfect 7-0 in conference play and have won 17 straight matches. First serve from Butler’s campus is slated for 3 p.m. The baseball team will return to conference play with another three-game weekend home series, this time against Creighton. The Bluejays enter the week with a 16-7 record following a 2-1 series against Kansas State. This will be the first conference game of the season for Creighton. Last year, the two teams each took one of two games against each other after the first game of a three-game series was cancelled due to weather. First pitch from Bulldog Park is scheduled for 4 p.m., and the game will be broadcast on the Butler Athletics Facebook page. This past weekend, the Butler men’s and women’s track teams competed at the Gibson Invitational in Terre Haute, Indiana. The Bulldogs set a total of 22 personal bests at the event. After a week off from competition, these two teams will return to action at the Ball State Challenge in Muncie, Indiana, on Saturday. The Bulldogs last competed at the event in 2017. Competition will take place exclusively on Saturday. The women’s golf team will continue a busy week when it travels to West Lafayette, Indiana, to compete in the Lady Boilermaker Invitational, hosted by Purdue, on Saturday and Sunday. Last year, the Bulldogs finished fifth out of six teams in the event. This will serve as the team’s final tuneup prior to the Big East Championships, which takes place on April 19-21 in Callawassie Islands, South Carolina. The Butler men’s tennis team will return to action on Saturday with a Big East contest against Marquette. The Bulldogs are coming of a 4-2 win over UIC this past weekend, and are now 18-6 on the season, including 2-1 in conference action. The Golden Eagles are coming off a 4-2 loss against St. John’s and are 12-7 on the season. First serve from the Butler outdoor tennis courts is slated for 12 p.m. The lacrosse team will get back to Big East play on Saturday when they return home for an afternoon contest against Denver. The Pioneers enter the week with a 10-2 record, including a 2-0 mark in Big East play. They’ll play Fresno State at home on Thursday before traveling to Indianapolis. Last season, the Bulldogs fell to Denver 16-1 in Colorado, with their lone goal coming from Adilyn Smith. This game is scheduled to get underway at Varsity Field at 12 p.m. The softball team will return to Big East play on Saturday when it plays host to Georgetown for the first two games of a three-game series. The Hoyas enter the week with a 9-27 record, including a 2-6 mark in conference, after being swept by DePaul over this past weekend. Last season, the Bulldogs took two of three games from the Hoyas in Washington, D.C., including a 7-6 extra innings victory where Madi Christiansen hit the game-winning home run. First pitch for the first game of Saturday’s doubleheader is slated for 12 p.m., and both games will be broadcast on the Butler Athletics Facebook page. The baseball team will continue its three-game weekend series against Creighton on Saturday with a 2 p.m. first pitch at Bulldog Park. The women’s golf team will wrap up play at the Lady Boilermaker Invitational on Sunday. The men’s golf team will conclude regular season play when it travels to Springboro, Ohio, to compete in the Wright State Invitational. The Bulldogs were slated to play in the event last year, but it was cancelled due to weather. Following this event, Butler will have just under two weeks off from competition to prepare for the Big East Championships in Callawassie Islands, South Carolina from April 26-28. The men’s tennis team will conclude Big East regular season play on Sunday against the DePaul Blue Demons. DePaul is coming off a 4-1 loss against Drake over this past weekend, and enters the week with a 10-12 overall record and 4-2 mark in conference play. After this match, the Bulldogs will travel to Cayce, South Carolina, for the Big East Championships from April 19-21. First serve for this final regular season match is slated for 12 p.m. at the Butler Outdoor Tennis Courts. The softball team will wrap up its three-game home series against Georgetown with a 12 p.m. game at the Butler Softball Field, streaming live on the Big East Digital Network. The baseball team will wrap up its three-game weekend series against Creighton on Sunday with a 1 p.m. first pitch at Bulldog Park, streaming on the Butler Athletics Facebook page.